I've asked some people who love books to choose their favourite book to read aloud. I certainly enjoyed their responses and I know you'll find many books here to share with your own child, as well as great tips to add extra value. Read Aloud Roundup (2) will bring more titles tomorrow. My daughter is now into chapter books, but she’s not ready to give up her picture books. That’s okay. Neither am I. Sometimes, on a quiet afternoon, I sneak into her room and look at my favorite picture books. Eek! Creak! Snicker, Sneak is at the top of that list. Bugbear and Bugaboo are two little creatures who like to frighten children. They’re the ones who make the creaking noises on the stairs and the scratching noises at the windows. Their nasty tricks really crack them up. Parents try to explain away the noises, but a brother and sister are not convinced by their rational explanations. They discover the truth and decide to turn the tables on Bugbear and Bugaboo. The story is told in rhyming text. Now wait, I can hear you all groaning. Not another cheesy rhyming book! No. Not this one. 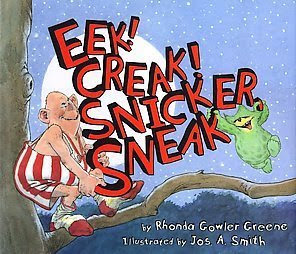 Rhonda Gowler Greene has written a deceptively simple plot and the rhyme is integral to the story. It’s part of the flow. The beat of the scary train is echoed by the rhyme’s cadence. The story is told with an abundance of sound aloud words like “They shinny up trees and jiggle and jump./ Limbs SCRITCH-SCRATCH and THUMP-BUMP-BUMP.” These onomatopoeic words not are not only great fun to say, but they blend perfectly with the rhymes. One line is repeated: “They snicker./They sneak./They make their plans/while schemingly rubbing their hairy hands.” This sing-song tone makes it a delight to read aloud. For some reason, it always brings to mind my favorite T.S. Eliot poem, The Love Song of J. Alfred Prufrock. Of course, the subject matter is nothing the same, but both have a sort of rambling canter that intrigues me. I won’t give away the ending, but my daughter loves it when I read the last pages of Eek! Creak! Snicker, Sneak in a soft whisper until we get to the giant ‘BOO!’ which always produces a giggle. This is a book that is fun for both of us, and not one we’re ready to retire any time soon. My favourite read-aloud books are Lynley Dodd's texts including Hairy Maclary from Donaldson's Dairy. The rhythm is great, there's plenty of page-turning action. It's almost musical. I love the words she uses and the names she gives her characters. And it's got nothing to do with 'Hairy McClary' being one of my nicknames. Other favourites from Lynley Dodd include Slinky Malinky and Schnitzel Von Krumm's Basketwork. Picture books are hard to write, and rhyming picture books even harder. These stories can be read easily from the first reading - the sign of great rhyme. Hairy Maclary from Donaldson's Dairy by Lynley Dodd. If I had to choose one book that is my favourite to read aloud it would be: The Great Castle of Marshmangle illustrated by Paul Hess. First published in Great Britain in 1999 by Andersen Press Ltd. ISBN 0862647924. I love this book because of the great language and rhythm, and the humorous and colourful illustrations. My favourite written page is where the grandfather is telling Michael that his name isn't really grandaddy, it's Hickory Horseradish. My other favourite is an illustration that made my young son giggle every time he saw it. The picture shows Hickory Horseradish climbing the Wooden Hill (the stairs) wearing brightly coloured patchwork pants that are hugely exaggerated in relation to the size of his body. My tip for reading aloud is to allow enough time between pages for the child to have a really good look at the illustration because this is where they get a lot of the meaning and understanding of the humour from. Also, with a book like The Great Castle of Marshmangle, you need to read slowly and savour the wonderful words. My favourite picture book to read aloud is Dogger by Shirley Hughes. I have been a fan of Shirley Hughes books since I was a child. Her first book was published in 1960 which is well before I was born but shows the longevity and popularity of her books. It was a hard decision to pick my favourite picture book. I picked Dogger because I never tire of reading it and the children never tire of listening to it. Although we may not read it for a few weeks, we always come back to it and read it several nights in a row. When I read Dogger to the children they are captivated. We like to linger over the pages taking in the very detailed illustrations which capture each moment so well. Many thanks to Kim, Claire, Dee and Laura for contributing their favourite read-alouds. Find more books here to share with kids, tomorrow on The Book Chook blog.